In 1993, three students, Tony Rosati (Georgetown University), Gina Pearson (American University) & Anne Holt (Florida State University), all activists within NAGPS, wanted to find a way to physically manifest support and appreciation of the contributions, impact and value of graduate students. Their effort led to a cooperative initiative called National Graduate & Professional Student Appreciation Week. Tony & Anne also realized that bringing in the endorsement of each state’s government (via a Proclamation from the Governor) would assist in building greater media attention to GPSA Week. This new program was well received by the NAGPS membership. 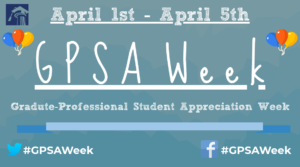 Since then, NAGPS member schools have celebrated Graduate-Professional Student Appreciation Week (GPSAW). Specifically, Graduate-Professional Student Appreciation Week seeks to emphasize the contributions, impact and value of graduate and professional students on campuses throughout the United States. Participate in a service event at a local charity! Most importantly, have fun in celebrating the important role that graduate and professional students play on campus! If you have any questions about Graduate-Professional Student Appreciation Week, please contact us. Also, when you decide what your organization will do to celebrate graduate and professional students, please let us know! We’re planning on compiling a listing of all GPSA Week activities in a future newsletter. For more information on planning your Graduate-Professional Student Appreciation Week, please consult our GPSAW Guide. As a part of Graduate-Professional Student Appreciation Week, NAGPS encourages graduate-professional student organizations throughout the country to request a proclamation in support of graduate and professional students from their governor, state legislature or city council. These proclamations serve as an important way to increase visibility and awareness of the graduate- professional student population and can serve as an excellent item to present to your general body, Dean, Provost or President at a special event during GPSA Week. Generally, obtaining proclamations is a fairly straight-forward process. First, draft a proclamation discussing the importance of graduate-professional students to your state, region or city. Once the proclamation is drafted, visit the website of your governor, state legislature or city council member and search for proclamation request. Sometimes it is helpful to call the office directly to ask for a proclamation request if such information is not available on the web. Typically the office will ask you for the drafted proclamation and will use the draft as a guide for the official proclamation. Once you receive your proclamation, take a picture of your GPSO’s officers and other campus officials with the proclamation and send NAGPS a copy at external@nagps.org. We’d like to post a collection of all of the proclamations received this year. We have provided some resources below to help you in your GPSA Week planning.